Armchair Fiction presents extra large editions of classic science fiction double novels. The first novel is Milton Lesser’s first published tale, “All Heroes are Hated.” The planet Earth had a strange way of rewarding its heroes: they put an “S” brand on their heads and hunted them down like packs of mangy dogs! After a terrible accident in which the entire Fomalhaut system had been destroyed, The interstellar government decreed that Earth was no longer allowed to step foot into deep space—and all of Earth’s space voyagers, the “starmen” were blamed. Banished to the hills, the starmen were forced to become bandits, to steal food and supplies needed for survival. But a wealthy man, an entrepreneur, had a plan. If the starmen would work for him for three years, he would remove the “S” brands from their heads—they would at last be free. But the entrepreneur made one big mistake—he lusted for and took Kenton’s wife. And Now Kenton wouldn’t rest until he rescued her and escaped to the stars. 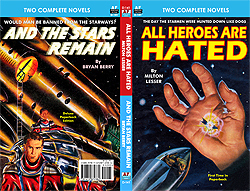 The second novel is “And the Stars Remain” penned by Bryan Berry. Bigwig News Chief Charles Wade had it on good authority that out near Titan, a little spaceman named Van Carlsberg had found a piece of the missing spaceship “Sunderling” floating in the void. The Sunderling had mysteriously disappeared in deep space several years earlier. But when Wade investigated he found that the little spaceman had been nowhere near Titan. So what was the truth of the matter? And more importantly, where did the fragment really come from? It could be the biggest story of the year, and Wade knew the answers might be found through use of the Martian Time Brain, an ancient mechanical portal into the past. However, no human had ever been allowed to use the Time Brain. But a back door deal between Wade and a member of the Martian Science Council soon had his ace newsman, Ken Waring, rocketing off to the red planet. What Waring found there was not only the truth about the Sunderling’s fate, but the future of Earth’s destiny in space.